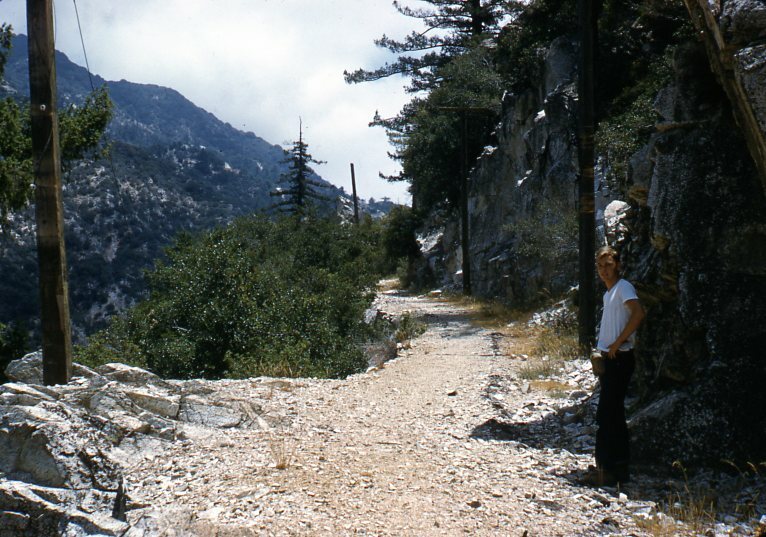 Stephen Dudley and his late father, Paul Dudley, decided to make a hike of the old Mount Lowe right-of-way and photograph their June 8, 1958, journey. 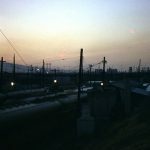 These images are from that trip, and we gratefully thank Steve for sharing them with our readers. 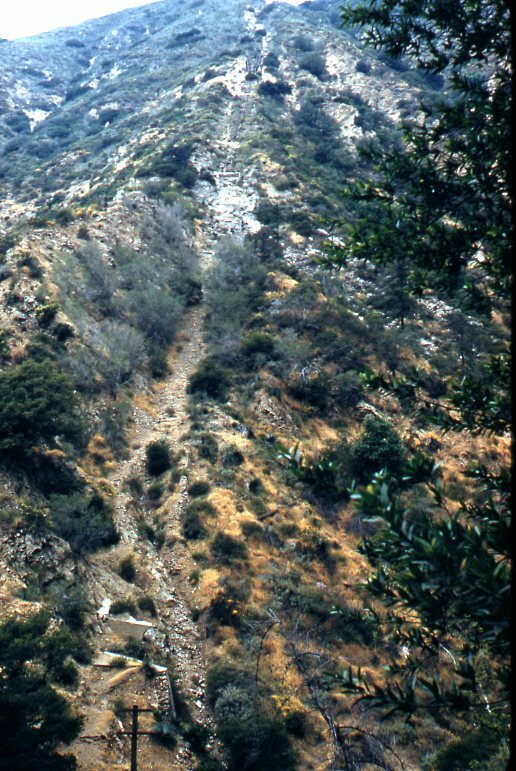 View from across Rubio Canyon showing the outlines of the abandoned incline right of way. 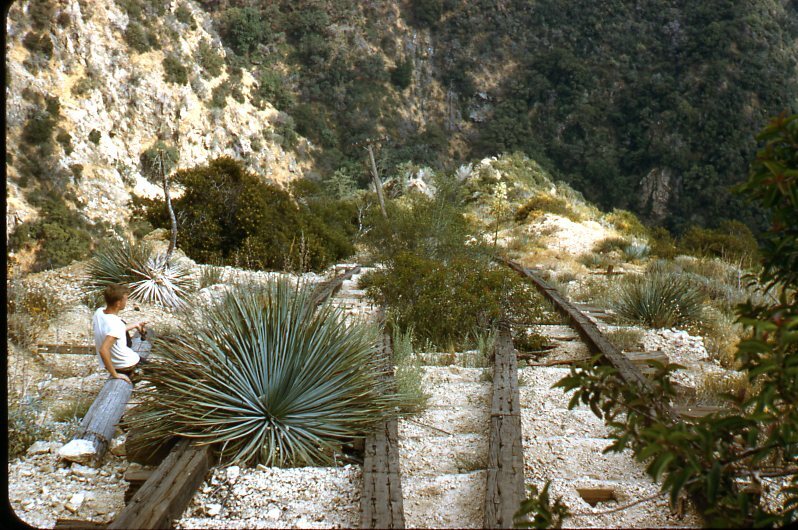 The rails were removed about 1940 — this was the condition of the right of way less than 20 years later and after vegetation grew and the weather took its toll on the topography. Looking down the incline at the turnout site where the two cars passed. 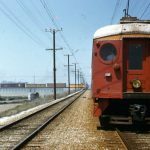 By putting a passing spot midway, it allowed the rest of the line to be constructed using three rails. 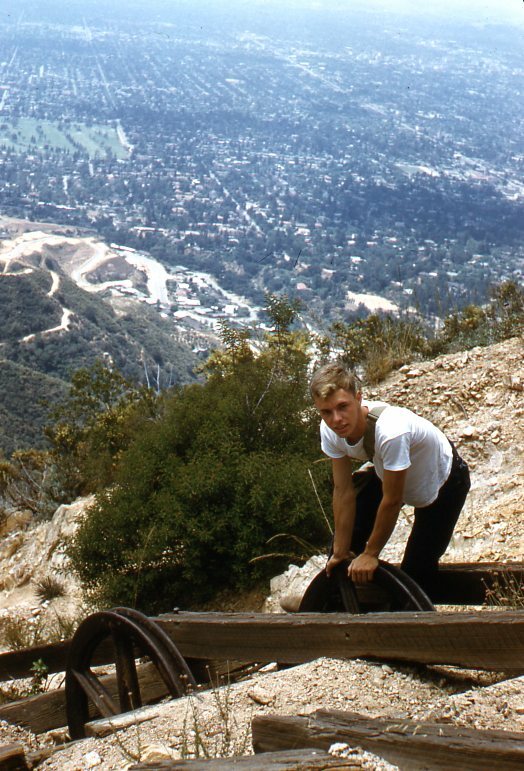 Along the incline showing the guide wheels for the cables. 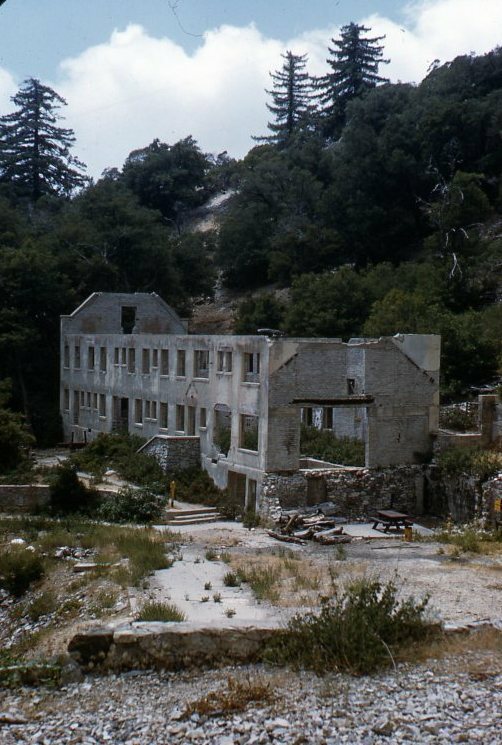 Power house at Echo Mountain. 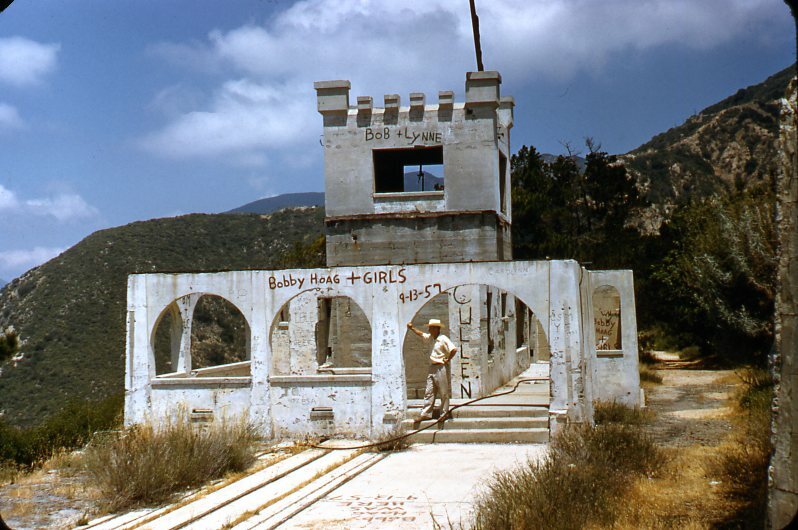 Several years after this photo was taken, the Forest Service took steps to demolish the structure. 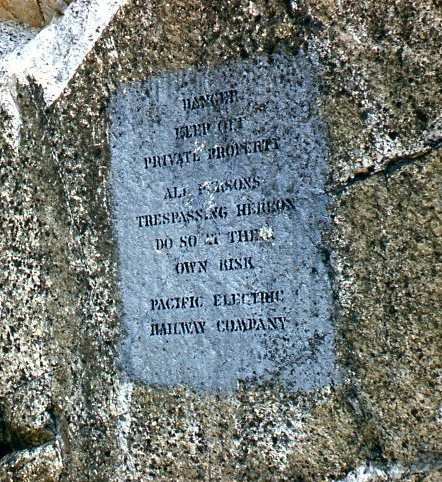 One of a number of notices posted by the Pacific Electric Ry. along the right of way. Along the right of way near the Granite Gate area. A curve on the right of way with the ties still in place. The right of way as it approaches Alpine Tavern. 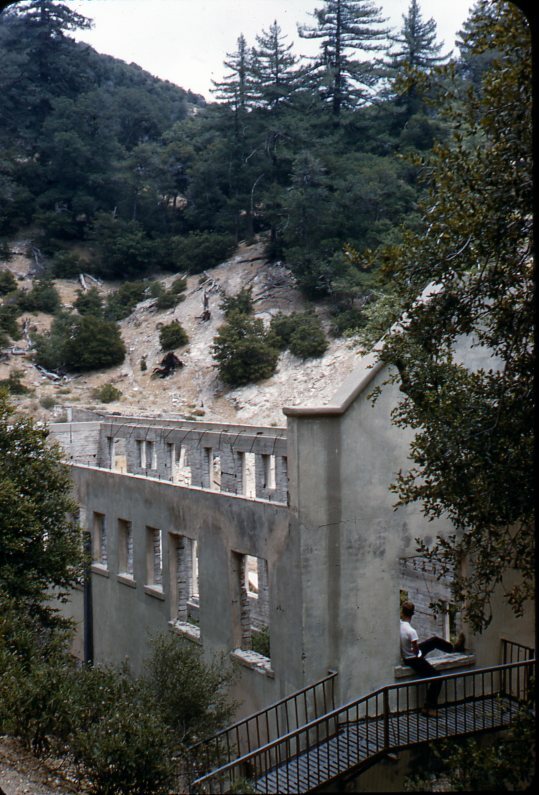 The Tavern burned in 1936 and as the remaining structure was felt to be a safety hazard, it was removed about 1959. Alpine Tavern. The rail line at the Tavern was re-configured slightly over the years. 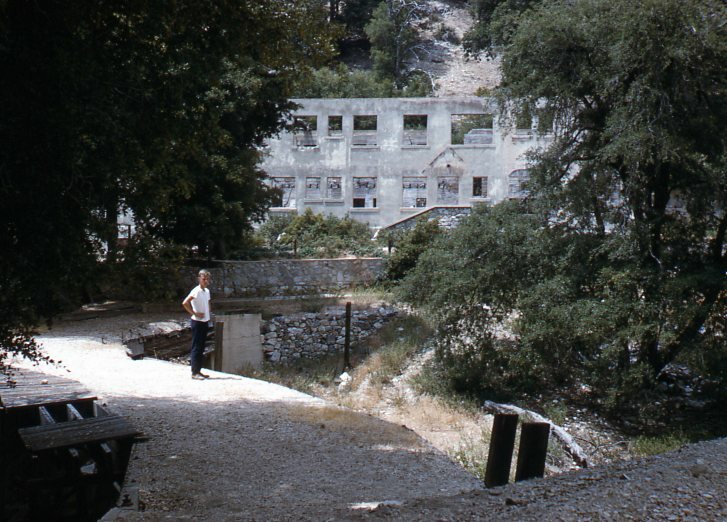 It ultimately terminated beside the walkway extending left from the base of the several steps in the middle of the picture. Alpine Tavern from the back side. Marvelous, absolutely marvelous. Thank you. Fabulous to see this material in color! Thanks a million! Thanks for the trip in the time machine, great to see it all before the dynamite ruined it. Priceless photographs. 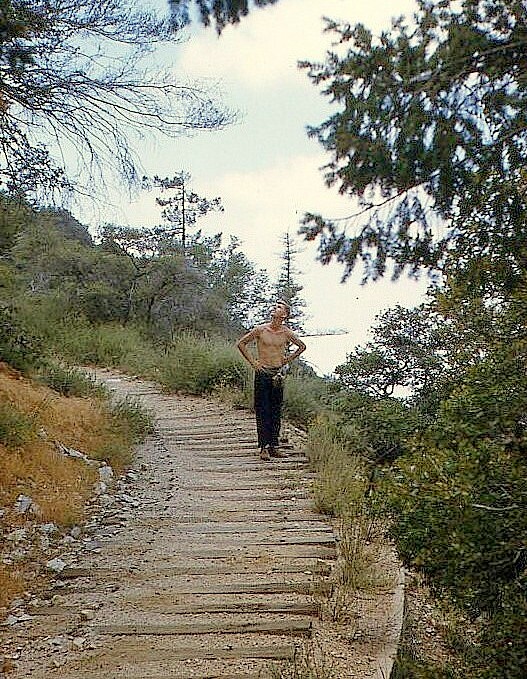 I remember the long, large ties on the Incline, from my hike with my father in 1978, just before the 1979 Pinecrest Fire burned all (or most) of them.